One of the most challenging aspects of being a writer is not writing (that's the fun part!) it's finding a home for our work. Even when we think we've found the perfect fit--a publisher or agent who accepts the type of material we're submitting--we still receive rejections. Why? Perhaps we haven't targeted the right person, maybe it's a timing issue or lack of market need, maybe we just haven't built up our platforms enough to attract an agent's attention, or maybe we simply don't know enough about our product to market it properly. And sometimes, it's just downright baffling! So to help us figure out how we can better target agents and editors, we've invited WOW! instructor Andrea Campbell to answer our questions on the subject and questions about her upcoming course The Gatekeepers: All About Agents and Editors--Getting them, Working with them, and Growing as a Career Author, which starts Monday, June 7th. If you're interested in learning all about agents and editors from a pro who will personally guide you through the process, there's still time to sign up. Visit our Classroom Page for full curriculum details. 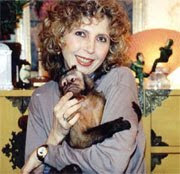 Andrea is the author of twelve traditionally published nonfiction books on a variety of topics including forensic science, criminal law, primatology and entertaining using interactive games, among others. Her latest book is the 2nd edition of Legal Ease: A Guide to Criminal Law, Evidence and Procedure, which as just been updated and fashioned into a college law textbook. Her next book, a historical-biography about the world's first detective, will be released later this year with Overlook Press. Andrea is a member of several professional organizations and stays current with book business. Her classes always offer students much more than they thought they'd get. One of her students got a "very good deal," and, according to Publisher's Lunch, a $100,000-plus contract. We ask Andrea about that student in this interview. WOW: Welcome, Andrea! Let's start by talking about your upcoming e-course, The Gatekeepers. Who should take your class on agents and editors? Is it only for authors? Andrea: Angela, thanks for having me. The Gatekeepers e-class was set up specifically for authors, but it will also apply to advanced writers who have a book idea that has gone through some considered thought. It is tightly focused on a writer's interests in terms of obtaining publication and it addresses their needs toward that end--but the class also provides evergreen information, useful for furthering an author's career. WOW: Why is it important for authors to learn about the publishing business? Andrea: If you were going to start a small business, say, dressmaking, you would go seek out a workspace, purchase work equipment, set up accounting, secure your business name, find a supplier for your fabrics and such, and make sure your patterns were current and in fashion before you hired additional workers. You also don't want to set up your shop next to someone else's dress shop unless you want your business drained off. Why would anyone go into publishing without learning the industry? This is a business after all and the more professional you are, the more realistic you are about the industry, the better your odds of succeeding. WOW: I like that analogy! And you're so right. It always surprises me though how often aspiring authors jump into the business without learning all about it. It just creates more work in the long run, and this is already a slow industry! In week two of your course, you cover an author's platform. What are some key points authors should consider when creating a plan for their platform? Andrea: Platform is really about positioning. And it is not something that can be created in a month or two of effort. Platform is what you bring to the table. Here is the publisher at this meeting and he is looking to invest a lot of money into an author. He thinks to himself that it would be best to work with someone who already has customers, or at least interested readers and potential buyers for the product. If you can say, "I have a blog in my subject area that nets 20,000 visitors a month," or "I have a newsletter that goes out to 10,000 subscribers," "I have a radio show that airs on Friday nights that gets the best _________ (fantasy, romance, whatever) writers in the business," and so forth. These desirable entities do not spring up overnight but take concentrated effort and planning. WOW: Having an established audience is definitely attractive to publishers. You also cover getting an agent or editor in your class. How can an author craft a query that will catch an agent or editor's attention? Andrea: The name of the game is knowing your product, being able to describe it in an intriguing manner, having relevant credentials, and keeping your professional letter to one page or a page and a half. That's no little feat. WOW: What are some things an author shouldn't do when crafting her query? Are there any big "don'ts" to avoid? Andrea: Don't say your mother/friend/writing teacher, etc. loved it. Who cares? Don't use a generic "Dear Editor" greeting. Don't fail to mention pertinent awards. Don't fail to know your audience. Know the difference between audience and market. Don't do things that will label you a novice. WOW: Those are great tips! I know agents usually specialize in certain genres or subjects. How can authors find the right agent to target before sending her query? Andrea: A huge part of The Gatekeepers is marketing. And that marketing component means many different things. We figure out what sells. We figure out who buys what you write. We figure out what agents like and don't like. And that's just the beginning. It's research. There are a lot of websites that carry this information, but you have to dig it up and make sure it's current. WOW: That's true; the industry is always changing and it's important to keep current. In your course description you say that "a lot of what you'll learn is not clearly visible." Can you explain this concept to our readers? Andrea: One thing we do is discuss what readers want. If you don't know how your book benefits your targeted reader, it's probably a vanity effort and you have not gone beyond first-level thinking. There is a psychology to sales, and we learn to tap into that psychology. To find not only the universal message but to find your exact reader and why they should buy your book. WOW: That's very helpful! So what do you ultimately hope students will learn from taking your course? Andrea: I don't hold out hope. I am a difficult taskmaster. If you are not doing the work, it's obvious. I suggest that students clear their plates. I will read your assignments, tell you where you've erred, and expect you to learn from it. We have a chat every week that allows students live sessions to brainstorm and ask questions. There are no vagaries, so hope is not an option. It's do this or don't move forward. It's as easy as that. WOW: You are a "difficult taskmaster!" I love that. It produces results. Tell us a little about your student who received what Publisher's Lunch calls a "very good deal"--a $100k+ advance. That's amazing! You must be very proud! Andrea: Jeannie Ralston wrote, The Unlikely Lavender Queen: A Memoir of Unexpected Blossoming. In fact, we chose the title in class and the publisher kept it, which is quite a coup today. Jeannie had a great experience to share but couldn't find her focus. She had left a flourishing writer-editor career in New York, to begin a life in rural Texas as a lavender farmer because that is what Robb, her husband, yearned for. They had visited Provence, in France, and her husband wanted to settle down in the country--so a deal was struck--she'd move to Texas if Robb would agree it was time to have children. But her National Geographic photographer husband was still taking photo assignments to exotic places and guess who had the farm and the kids? Jeannie not only discovered her "muster" but also became the largest lavender farmer in the southwest, Hill County Lavender. It is really a transformative story for anyone who dreams of another life. WOW: That's an amazing story! Both the deal and the book! Thank you, Andrea, for sharing your tips with us today. Do you have any parting words of wisdom for our authors-in-waiting? Andrea: If you want to succeed in this hard-knock business you need the foundation and knowledge of how to be a professional first. I once heard an agent say, "Ideas are hard, we can teach anyone to write, but content is still king." Thinking is hard, if it weren't we would all do it longer than five minutes. Readers, if you're interested in learning more about getting an agent or editor from a pro, remember, Andrea's The Gatekeepers: All About Agents and Editors--Getting them, Working with them, and Growing as a Career Author starts next Monday, June 7, 2010. It runs for 4 weeks. Visit the classroom page to view what you'll be learning week by week. Enroll today to reserve your spot. Happy writing! Thank you for featuring Andrea Campbell on your blog. She has a wealth of information that any auther who hopes to get their book published needs to know, and I intend to check into the class. Thank you very much for this post, it was both informative and interesting. Hopefully Andrea will offer the Gatekeepers series again in a few months when I'm feeling more ready for it.